My nakedness blossoms with him, sated. the mouth of my dark cave. 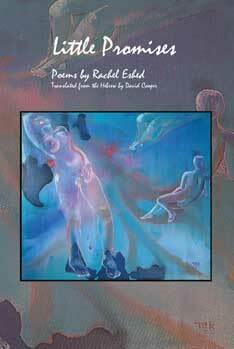 Rachel Eshed was born on Kibbutz Degania Aleph in 1951, the daughter of holocaust survivors. She has studied theater and fine arts in Israel and London . In 1995, “Havtachot Ktanot” (“Little Promises“) was published by Kibbutz Hameuchad; the manuscript received the 1992 AKUM Prize (AKUM is the Israeli equivalent of ASCAP). 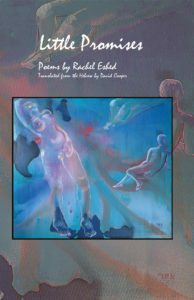 Her third book, “Shkufa Bachalon” (“Transparent In The Window” – 1999), received the 2001 the Bernstein Prize for Original Hebrew Poetry. Translator David Cooper earned an MA in creative writing at The City College of CUNY where he won the Academy of American Poets Prize. His ebooks are published by http://pulpbits.com; poems and translations have appeared or are forthcoming online and in numerous periodicals.